Pretzel Logic's Market Charts and Analysis: SPX and RUT Updates: Has the Market Finally Reached a Tipping Point? 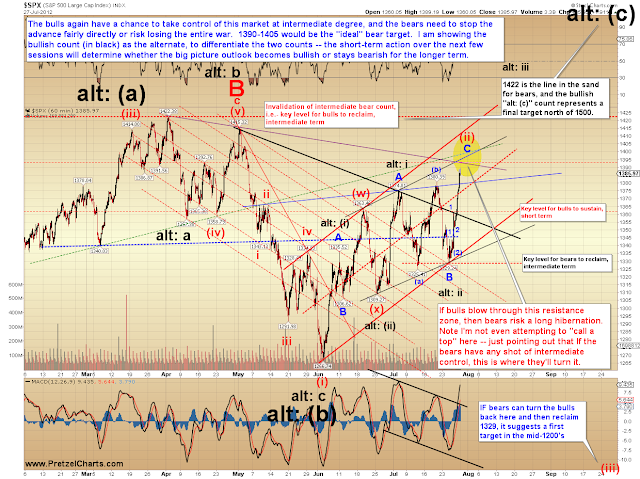 SPX and RUT Updates: Has the Market Finally Reached a Tipping Point? A few readers have asked why I haven't published much in the way of longer-term projections recently (outside of a few hypothetical if/then type charts, which were contingent on key level breaks that never came), and the simple answer is: there haven't been any longer-term projections I've had much confidence in lately. About a month ago, once the market rallied back above the 1363 swing high, everything got a bit hazy for the longer-term outlook. And while July was a good month for the short-term portion of this update, I haven't done much focus on the bigger picture because I felt there were no clear targets to focus on. In retrospect, this was the correct approach. This has been a challenging market across the board, and the market has repeatedly punished traders who've held positions longer than a few days. And while I've been preaching for several weeks that traders should remain cautious and nimble, and that no result could be counted on as long as the market stayed range-bound, I now believe the market has finally reached a decision point. I suspect that what happens over the next week or so will telegraph the intermediate-term direction fairly clearly. I'm not a big fan of following news and believe that news is generally noise -- in other words: the charts tend to lead the news. However, I have always stated that genuine central bank policy actions (not rumors, but actions) do not qualify as news noise, because central banks represent liquidity... and liquidity drives the market. As I've been discussing for several weeks, the charts haven't been crystal clear for the longer-term, but did appear to be coiling for a big move. It would now appear that the market has been waiting on the central banks. This coming week, leaders will be meeting to discuss monetary stimulus -- and the charts suggest that the market has finally reached a tipping point, coincident with these meetings. Interestingly, the charts could support either outcome: A disappointment for the bulls (i.e.- no printing) should lead to a sustainable decline; but an announcement of more printing should lead to a sustainable rally. So the two main potentials visible in the charts seem to match the reality of the central bank fundamentals quite well. The nice thing about following the charts is that no matter which announcement comes and which way the market breaks, the charts will then provide us with longer-term targets. I'm pretty sure that the news won't provide that much detail. Friday's bullish trade trigger I published for the Russell 2000 (RUT) was activated early in the session, and then easily reached and exceeded its target (as I stated Friday, the target was conservative). I now want to update the bigger picture RUT chart, previously published on July 15, because the targets for the pending trade triggers ("pending" meaning they never triggered and became active) have changed. Since the pattern has changed since they were originally published, I want to update them now before price crosses any trigger points -- additionally, there are two new short-term trade triggers which I've added. This market may actually become more challenging going forward, because it is still trading in a large range, and strange things can and do happen in trading ranges... I think traders should remain very nimble until the market breaks out of this range. These types of ranges can be very challenging to trade profitably, and if one doesn't take profits quickly, the ongoing price overlaps can nickel and dime one's account to death. A range like this suggests the market is coiling and building up potential energy for a large and sustained directional move, to be launched at some point in the future. I continue to believe that this trading range has been part of the energy-building process -- but there are now, finally, some indications that market is ready to make a decisive move soon. 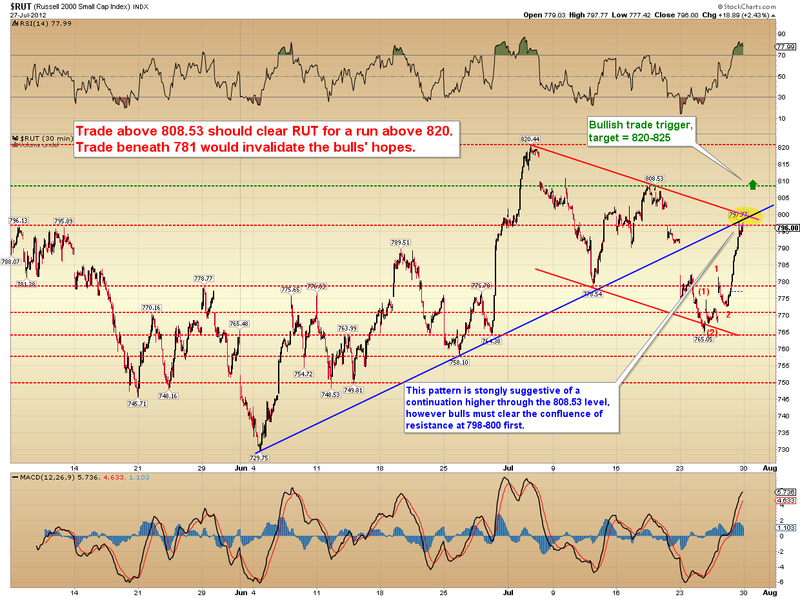 A close up version of the RUT chart with some additional support/resistance lines and info is shown below. Note the 781 level applies over the short-term only. It's interesting how much RUT has lagged the S&P 500 (SPX) during this recent rally. SPX has made clean new swing highs, but RUT hasn't even broken through its lower-high July peak yet. 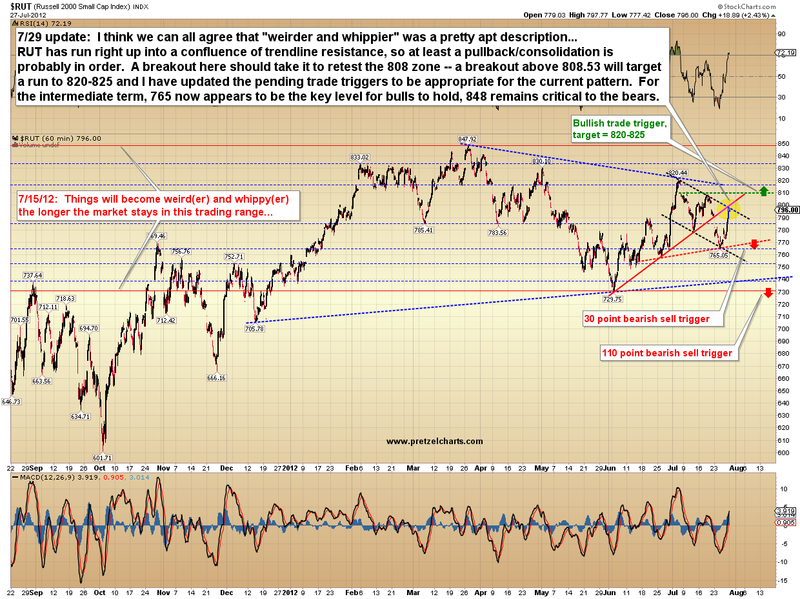 The SPX chart below shows that there is a confluence of trendline resistance in the zone just overhead. Bulls need to break through this zone to gain clearance for a larger rally, so if bears want to maintain intermediate hopes, then this is where they need to launch a counter-attack. The pattern of the last two months is finally reaching another point where it could close the fractal. If bears can close the fractal in this general area (the current blue C-wave would equal A near 1395) and then retake 1329, they will almost certainly gain control of this market for the next several months. If they can't close the fractal here, then bulls have a good shot at launching a strong and sustained rally from this pattern. Again, what happens over the next few sessions is highly likely to reveal which side will control longer-term direction, and I've listed a couple preliminary targets, dependent on some price trigger points. I had drawn up a longer-term chart, but I want to hold off on publishing it until the market has clarified a bit more and is out of the noise zone. 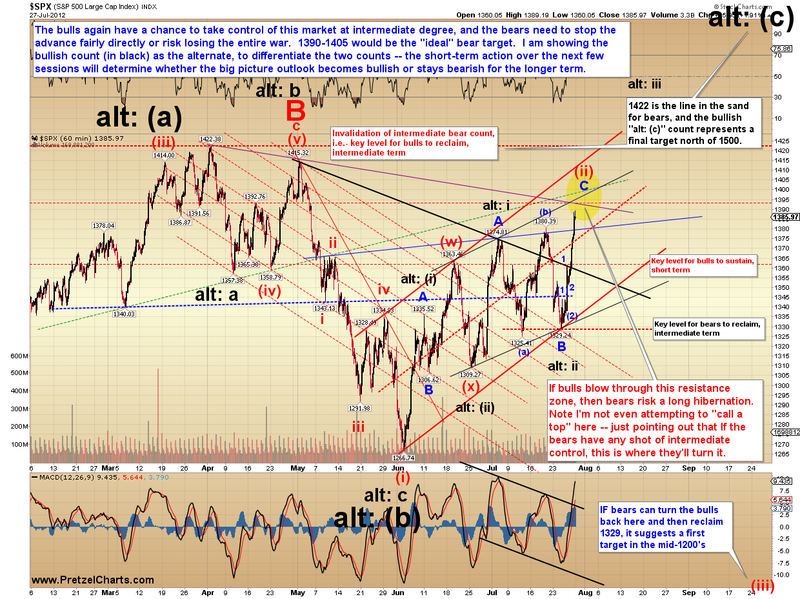 Instead, I've outlined the key levels to watch on this chart. 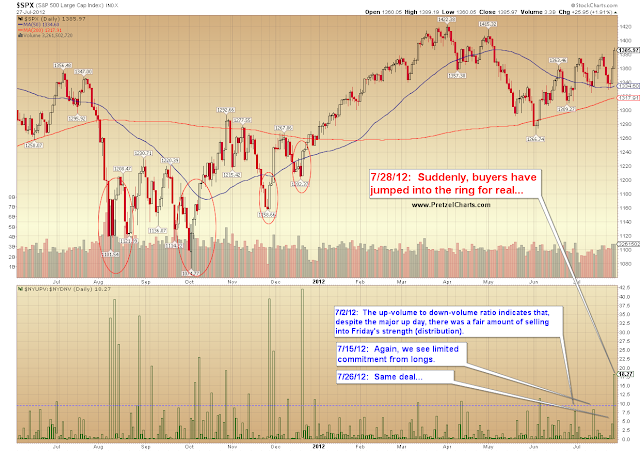 A chart that might be serving as a warning to bears is the up volume to down volume ratio, which measures accumulation. Friday was a very strong accumulation day: in fact, it was the strongest accumulation yet seen in 2012. This suggests that while there may or may not be some consolidation or retrace here, eventual higher prices are pretty good odds over the near term (if not longer). My first reaction when I looked at this chart was, "Somebody knows that there's monetary stimulus coming, and they're front-running it." We should know soon enough. In conclusion, the market is again flirting with the upper edge of the noise zone, and thus there's still not much to talk about for the intermediate term, at least not with any conviction. However, this now appears to be a major decision point: if bears can close the fractal soon, they can still take control of the longer term. If they can't, then it's probably time to start wearing some bull horns. Trade safe.